BEIJING, China (CNN) -- Police shot and killed two ethnic Uyghurs and wounded another in a Chinese region that has seen violent ethnic strife in recent weeks, state media reported Monday. The police were trying to stop the three people from attacking a fourth person with clubs and knives in Urumqi, Xinjiang, China Radio International reported, citing the local government. All four people involved in the incident were ethnic Uyghurs, a minority Muslim group distinct from China's majority Han population, CRI said. At least 184 people were killed in demonstrations in the region eight days ago, and more than 1,600 injured, according to government figures. Chinese President Hu Jintao cut short a trip to the Group of Eight summit in Italy last week in the face of the violence in his country. 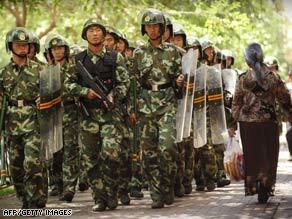 Heavily armed troops remained on the streets of Urumqi over the weekend, and curfews were in effect. On Saturday, the Chinese state news agency Xinhua reported that Urumqi has banned public assembly without police approval. "Assemblies, marches and demonstrations on public roads and at public places in the open air are not allowed without the permission by police," read a notice by the Public Security Bureau of Urumqi, Xinhua said. The Urumqi security measures on public assembly came on the eve of a sensitive day of mourning, media reported. It is traditional for ethnic Han to mourn their loss on the seventh day after a death, the South China Morning Post reported. The violence is a result of ethnic tensions between the Uyghurs, who are predominantly Muslim, and members of China's Han majority. Hundreds of Han Chinese were on Urumqi streets on July 7, holding sticks and pipes, and calling for punishment of the Uyghurs, who they say committed serious crimes. The Uyghurs say they have been victimized and many of those killed in the violence were Uyghurs. Uyghur religious leaders have condemned the violence, saying it is against the spirit of the Muslim faith and Uyghur tradition.